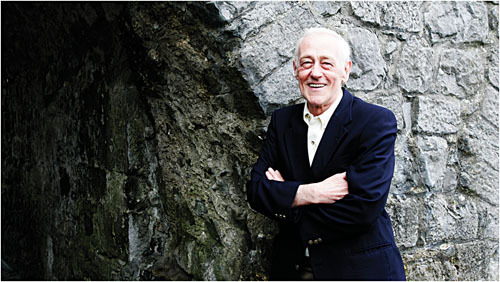 John Mahoney appears in the The Outgoing Tide which runs at the Town Hall from Tuesday July 17 to Saturday 21 at 8pm nightly, with 2pm matinee shows on the Wednesday, Friday, and Saturday. Since its earliest days, one of the defining characteristics of the Galway Arts Festival is the way it has forged strong friendships with its featured performers and invited them back for repeat visits. Mahoney’s love affair with Galway began with his first arts festival appearance, in Long Day’s Journey Into Night in 2000. “That was so great,” he recalls fondly. “I remember going out with Tom Murphy afterwards and saying to him ‘Gee Tom, the audience were there for nearly four hours and I never heard a sweet-wrapper open or a chair squeak or anything’ and he answered ‘John, what they’re watching up there, that’s sacred to us’. Mahoney was born in 1940 in Blackpool, where his family had been evacuated due to wartime bombing raids on their home city of Manchester. Though he came from Irish stock, it wasn’t until adulthood that he developed his own sense of Irish identity. Mahoney emigrated to the United States as a young man when his older sister, Vera, a GI bride, sponsored his move. After graduating from Illinois University he worked in teaching and as editor of a medical journal. It was not until he was in his thirties that his childhood love of acting resurfaced and prompted him to make a dramatic career change. Mention of Frasier brings us to the role with which Mahoney will always be associated, Martin Crane, father of Kelsey Grammer’s Frasier. He featured in the show from its inception in 1993 to its final episode in 2004. He describes how his cameo appearance in Cheers led to his getting his most famous role. The success of Frasier brought Mahoney a whole new level of fame and he describes the impact that had on his life. “After just three or four episodes had aired my whole life changed totally,” he says. “People were wanting autographs, pictures, people were offering me jobs without me having to read for them, I was getting seats in restaurant without reservation, and everyone on the street was recognising me and waving and yelling at me, all sorts of things. While enjoying success in TV and film, Mahoney has continued to perform regularly in theatre and The Outgoing Tide was greeted with rave reviews when it premiered in Chicago last year. Both poignant and funny, the play casts Mahoney as a retired union negotiator, Gunner, who realises his faculties are fast diminishing and has hatched a plan to secure his family’s future – but his plan meets resistance from both his wife and son. Audiences will also love the work that John Mahoney and his fellow cast members Rondi Reed and Thomas J Cox deliver in Graham’s absorbing drama.